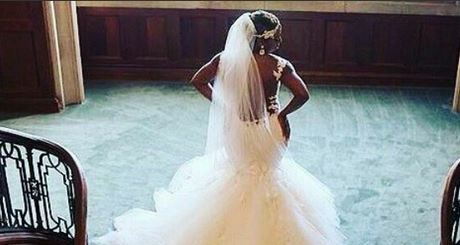 An image of a woman clad in a fish tail wedding gown has been circulating on social media. The woman looks striking in a white wedding gown which has a long veil and gorgeous sequinned detailing in the front. 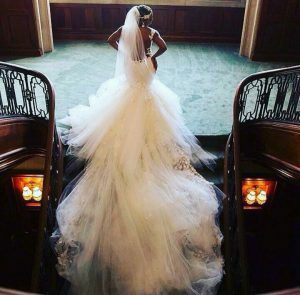 The pic has been circulating on social media with many people believing that it is Minnie Dlamini who got married to Quinton Jones today. However, the picture is not of Minnie who now goes by the surname Mrs Jones. 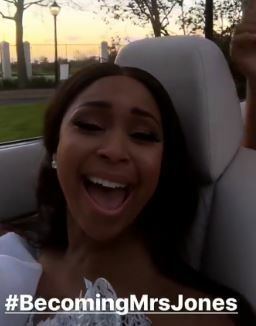 It is not clear who the woman is, but judging from a video Minnie put up on her Instagram Stories, it is not her as she is wearing diamond stud earrings and does not have a head dress around her head. The woman in the image is also a darker skin tone than Minnie and the media personality had her hair styled loosely around her shoulders. Phil Mphela, a TV blogger said guests had been asked not to share images of Minnie as these were reserved for her wedding special set to air on October 13 on Vuzu Amp.